Brochure or Catalogue? What’s the difference? Not a lot you might think. But you’d be wrong – when it comes to design the two are as far apart as breakfast and dinner on a bad day. The two serve quite different purposes and need to be treated as such if the resultant product is going to be anywhere near meeting its targets. For normal human beings that translates to catalogues (usually) want to sell you one or more products from a whole list of goodies with prices while a brochure is more of a touchy-feely marketing tool – and if any smarty-pants asks why holiday “brochures” are called brochures and NOT catalogues I shall summon dark forces to make your tea go cold. In design terms it is massively important. Catalogue design, particularly if you’re selling off the page is far more of a science than you might imagine. For a catalogue to achieve its full potential, you’d be wasting your time without an understanding of square inch analysis and product density; knowing where the important “hot spots” are; understanding how to change the pace at which a reader is scanning the catalogue with “stoppers”; how to use “heroes”, and so on and so on. A brochure is less scientific but no less important for all that. 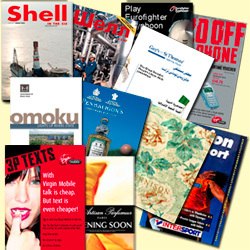 Without the need to achieve specific performance (in terms of sales) from a given area or number of pages, a brochure provides more scope to explore other areas of creativity. Having said all that the most important consideration for a designer is understanding the difference in such a way that they can produce the best possible designs for any given application. This entry was posted in Design and tagged Brochure Design, Catalogue Design by Pete. Bookmark the permalink. I like your website. Very practical and very motivational. Thanks a bunch. This will help me a lot. I read your articles and get a lot of info that I never know before. It’s hard to find knowledgeable people on this topic, but you sound like you know what you’re talking about! Thank you for discussing such an topical article with all of us. I’ve bookmarked your blog will come back for a re-read again. Keep up the excellent work. Thanks for all information which you gave us. Its very usefull. I’ll come back For sure. So see you soon!!! Hi, I found your blog on google. I’m pretty glad to have found your website because I think it is amazing! I will definitely come back! Great resource for my students. Thanks you for information.It is very useful to new guys.These are very useful tips in blog writing. Again thanking you. What a great article. Very inspiring !!! Thank you for give very good knowledge – What a cool site.